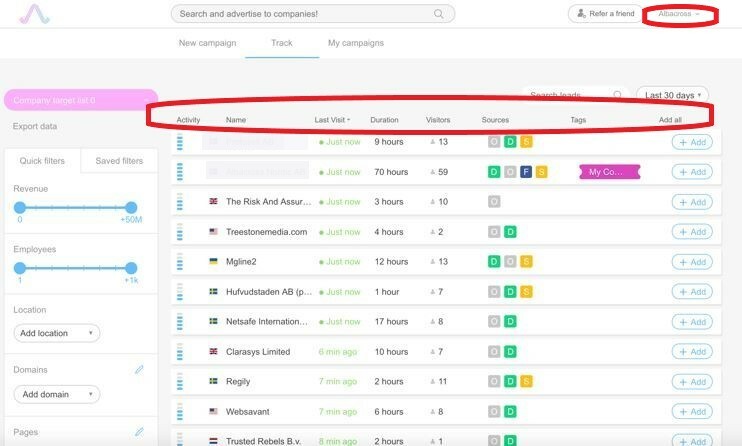 Albacross is a free online tool developed especially to help you track visitors to your site, so you can convert more of them to actual customers. Albacross has proved to be quite straightforward in my experience, and following registration, using your company’s details, you can dive right in and see if you agree. You’ve signed up now what? The most immediate option is to conduct a direct search. On your homepage, go to the search bar and fill in a keyword relevant to your industry. This will provide a list of companies that have visited your site, from all over the world. Select the leads from the list that interest you to find out more detail (see below for more). Let’s say you have a cosmetics company, supplying beauty products to spas and retailers. Type in Beauty. Then narrow down the list by, for instance, selecting employees: 20+ and Revenue: 500k+. You now have a targeted list, based on those criteria, full of ripe leads. This option takes a bit more time as Albacross needs a few days to collect data from your website and furnish your dashboard with leads. Once that process is complete, however, you will have real-time updates to your lead list. 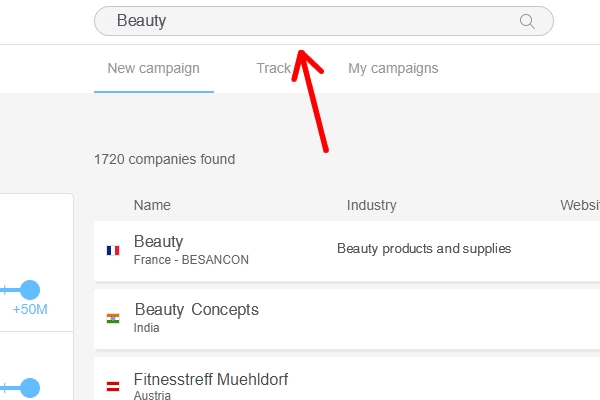 Set up lead tracking by inserting a few lines of code onto your website. Create custom domain, tag and page filters by selecting the pen to the right of each filter listed in the dashboard, you can then add specific visitors that you would like to be able to filter. Click on any of the spreadsheet headings, to sort your list according to that heading. Eg, activity, will arrange the list by highest to lowest/lowest to highest visitor activity. To find out detailed information about each visitor, you can click on the company name in the main list. This will show details about the visitor’s company furnished by Albacross’ database. This information includes the company’s particulars at a glance(including physical location and sector), its key statistics (including estimated revenue and employees), a page analysis (including number of visits and visit duration) as well as the names, positions and contacts for key employees. You will also get an overview of their activity over the last 30 days as well as a nifty map showing their geographic location. Use the Quick filters tab on the LHS dashboard to analyse the list according to your immediate needs. These filters include, total revenue, country, domain, pages(where the visitor went on your site), tags, number of employees and sources. You can also create new filters as needed (see the bottom of the list on LHS dashboard). 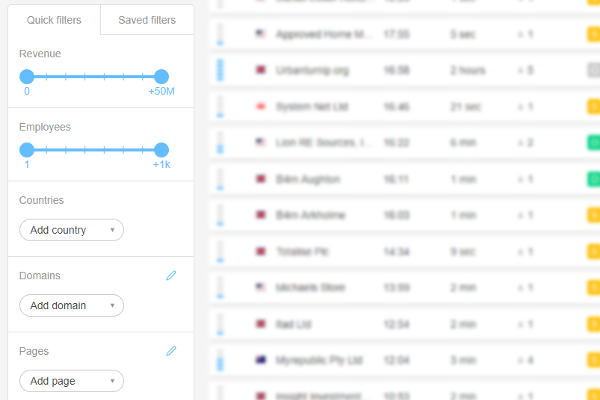 Or use the Saved filters to save a custom selection of the above filters to create a long-term overview of lead changes. You can now assess the data whenever you like, by accessing your account via Albacross. Alternatively, you can set up a custom Email report. The final option lets you upload a client list as a .csv file including company name, and company number or domain name. Albacross will cross reference the companies against their database, to tell you who’s been visiting your page. I have found Albacross to be a pretty intuitive system that allows you to track the movements of your site visitors. 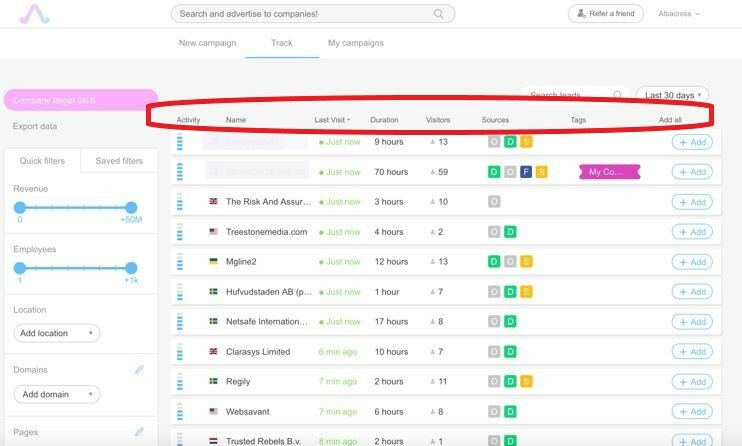 If you’re an agency and you’re responsible for tracking and lead generation for your clients, by using your admin rights, you can also track their visitors, all from the same place. You can then track, set up mail reports, etc. all for individual companies that you are tracking. Once you have mastered Albacross’ lead generation function, you can go on to make those leads work by opting into their marketing strategy function which allows you to target campaigns to suit the valuable leads you have found.